While I was at the bar watching the Bruins sweep the Penguins on Friday night, I told my buddy that it didn't seem appropriate for me to get too excited. I take my sports fan-dom pretty seriously, and I don't think I've really earned the right to celebrate and cheer for the Bruins as if I've been rooting for them all along. Earlier this season when the lockout happened, I admittedly barely even cared. Four weeks ago as they trailed Toronto 4-1 with eleven minutes remaining in Game 7, I'd completely accepted their fate, and wasn't the least bit upset about it. 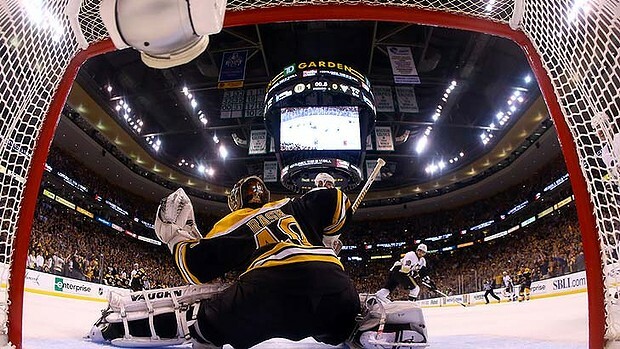 Rask's glove save as the final horn sounded was a fitting end. But when Adam McQuaid ripped that slapshot into the upper left corner of the net to break a scoreless tie 5 minutes into the third period, the bar exploded. Most of the people there hadn't even really been paying attention. Everybody jumps on the bandwagon in the playoffs, and it just keeps filling up more and more the longer they last. It's human nature, and I might as well accept it. Sidney Crosby, arguably the best player in the world, was held without a point for 4 consecutive playoff games for the first time in his career. Before the series started, Crosby (15), Evgeni Malkin (16), and Kris Letang (16) were 2nd, 3rd, and 4th in the league in total points this postseason (behind David Krejci). After combining for 47 points in their first 11 playoff games, the three of them registered a grand total of zero vs the Bruins. The Penguins 2 goals were the second fewest ever scored in an NHL best of 7 series. Tuuka Rask stopped 134 of 136 shots, a save percentage of .985. In rounds one and two of the playoffs Pittsburgh score 47 goals over 37 periods, for an average of 1.27 goals each period. Against Boston the Penguins netted only 2 scores in 14 periods; an average of just 0.14 goals per period (a drop off of 89%).